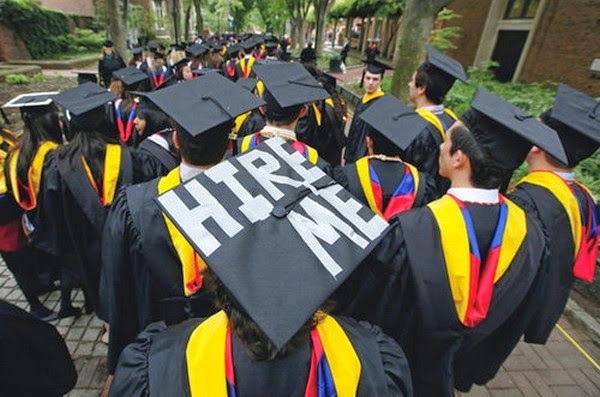 In six weeks newly minted college graduates will begin entering the workforce and according to USAToday.com this year they have a higher chance of finding employment. If it is true, it’s great news because seven of ten college seniors will graduate in debt. The amount ranges from USNews.com’s estimate of $27,666 to $28,400 from the Project on Student Debt. TheLadders.com is currently providing tips for recent grads searching for their first career on their site. The experienced friends of Work, Careers and Jobs @40+ offer career advice for 2015 graduates in this two-part blog post. #1: Keep a positive attitude. EVERYONE wants to have and keep people around with a good attitude. A good attitude can get you through even some tough early learning experience. And get everything in writing prior to starting a new position. (employee with > 20 years experience). LinkedIn, get on it before you graduate and learn to use it to search for a job. Most recruiters use LinkedIn and it is free. Your blog was forwarded to me from my Mom. She wanted me to share my story of getting my first professional job as a member of the Class of '15. I am graduating with a Bachelor of Arts in Psychology and recently accepted a position with a large retailer in Marketing. I have worked in retail sales for two Christmas seasons. I did an unpaid internship for class credit. I met a lot of people and begin talking to my internship coordinator about a full-time position last summer. I hope this helps you and your readers. Thanks for this, Brenda. Sometimes, the most necessary tips are the ones we treat as a given, such as being ourselves or keeping positive. But that's where our career paths lie: our sense of comfort in engaging with the job environment, and working with people for a considerable amount of time. We can't have those if we aren't comfortable with ourselves. We project that to others, whether consciously or not. Thank you for sharing valuable information about car services. Very Nice post. I enjoyed reading this post. Thanks for an awesome article! The choice of one’s career reflects his personality. If you want to show your skill so at first your need write a great resume. My university teacher recommended me Top5resumeservicereview.com for write a fantastic resume. Also, I think is really good idea to have someone who helps you in your resume writing.